Marker is displayed in the window at the pavilion. 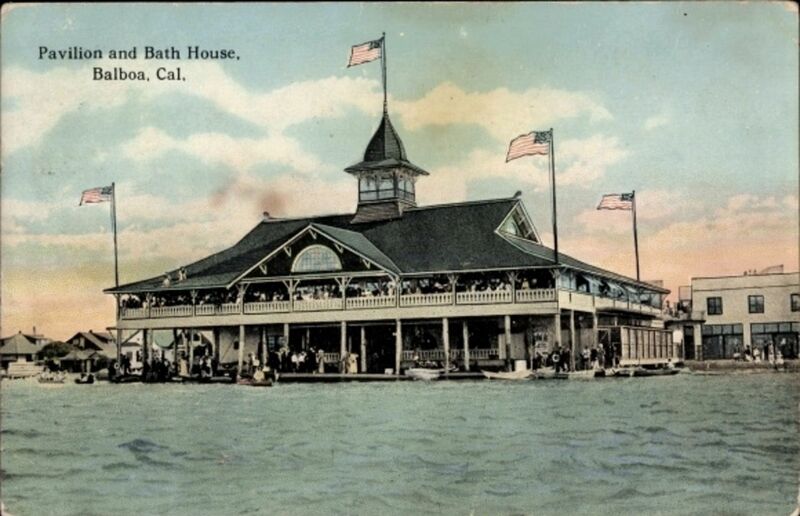 This is one of California's last surviving examples of the great waterfront recreational pavilions from the turn of the century. Built in 1905 by the Newport Bay Investment Company, it played a prominent role in the development of Newport Beach as a seaside recreation area. In 1906, it became the southern terminus for the Pacific Electric Railway, connecting the beach with downtown Los Angeles. The railway's red cars connected the beach with Los Angeles in only one hour. Location. 33° 36.156′ N, 117° 53.944′ W. Marker is in Newport Beach, California, in Orange County. Marker is at the intersection of Main Street and East Balboa Boulevard on Main Street. Touch for map. Marker is at or near this postal address: 400 Main Street, Newport Beach CA 92661, United States of America. Touch for directions. 2. Pavilion and Bath House, Balboa, Cal. measured in a direct line); First Water-to-Water Flight (about 700 feet away); First Ferry Service Between Balboa and Balboa Island (approx. 0.2 miles away); Old Landing (approx. 1.1 miles away); McFadden (Newport) Wharf (approx. 1.7 miles away); Site of 3rd National Boy Scout Jamboree (approx. 1.7 miles away); Mariner's Mile (approx. 1.8 miles away). Touch for a list and map of all markers in Newport Beach. Regarding Balboa Pavilion. This site has been designated as California Registered Historical Landmark No. 959 and listed in the National Register of Historic Places (NRIS: 84000914). More. 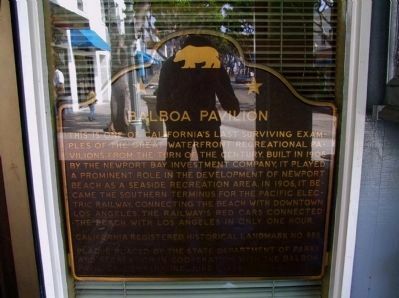 Search the internet for Balboa Pavilion. Credits. This page was last revised on January 22, 2018. This page originally submitted on December 10, 2011, by Michael Kindig of Long Beach, California. This page has been viewed 507 times since then and 8 times this year. Photos: 1. submitted on December 10, 2011, by Michael Kindig of Long Beach, California. 2. submitted on January 22, 2018. • Syd Whittle was the editor who published this page.